Industrial centrifugal pressure blowers and fans, radial fan blowers, high volume fan ventilators, high pressure industrial blowers, high temperature oven exhaust fans; and wall / roof exhuast and air make-up fan ventilators. 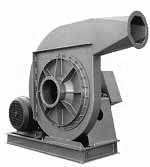 Manufacturers and distributors of industrial, process and commercial fans, blowers and ventilators. Static Pressures up to 50″ W.G. Design Features: Clean air handling fan designs, most commonly associated with the non overloading horsepower characteristic. Typically, large volumes of air at low to moderate pressures at high efficiencies are these fans trademark. Additionally, the horsepower curve has a peak value for any given speed, thereby allowing fan motor selection to prevent an over load condition given gas density remains constant. All fan models available in SWSI or DWDI and in standard AMCA fan / blower arrangements. Choice of backward-inclined, airfoil, backward-curved or forward-curved fan wheel, all types of motors, drive gaurds, air dampers and shutters, high temperature, spark-resistant / explosion proof fan construction. Service and Applications: General ventilating, light industrial, commercial air moving fan systems. Combustion air on kilns and furnaces, baghouse forced draft, blower aeration, industrial air conditioning. Static Pressures up to 45″ W.G. 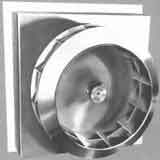 Design Features: These high-efficient backward curved, airfoil and backwardly inclined fans employ high efficiency impeller design for use in clean or moderately dust laden air streams. Designed as a higher efficiency alternative to a radial tip fan. Typical performances ranges are the same as a radial tip fan with increased efficiency and non-overloading horsepower characteristics. The rugged standard design allows these fans to be used in many of the same applications as the radial tip blowers. Backwardly curved fans are available in all standard AMCA arrangements and with most standard fan options. Service and Applications: Combustion air supply, baghouse induced draft, power generation cooling systems, high volume industrial exhaust, hgih temperature air moving, petro-chemical process applications. and high pressure process and induced draft air systems. The radial tipped wheel is made for extreme hard-use durability and dependability. Applications for air pollution control include baghouses, precipitators and scrubbers. Other applications comprise induced draft ventilation systems for boilers, incinerators and kilns, plus use with high temperature ovens, furnaces and dryers. All standard AMCA arrangements are available, in both Single-Width Single-Inlet and Double-Width Double-Inlet fan. Service and Applications: Industrial induced draft air systmes, dust collection, high pressure gas scrubbers, incinerators, industrial ovens and dryers, cement industry. for moderate to high pressures with low to moderate air volumes. These performance ranges are achievable due to the high tip speed capability inherent in these blower designs. Usually used in direct driven Arrangement 4, but high temperature fan arrangements are available too. Service and Applications: Chemical processing, combustion air, pneumatic conveying, high pressure air moving systems through long ducts, glass blowing and cooling applications. Design Features: Buffalo Blower offers a wide range of radial designs for heavy-duty industrial applications. Open Radial, Radial-Curve, Radial with Backplate and Riinforcing Gussets fan wheels designs are available, as well as abrasion-resistant wheel construction, housing liners, special alloy materials and protective coatings. All models available in standard AMCA fan arrangements (available in both SWSI/DWDI blower design). Service and Applications: From pneumatic conveyance of materials to air pollution control systems where particles must be blown through filter arrangements before being exhausted into the atmosphere. Varios material conveying fan applications, scrap handling though-airstream blowers. Design Features: Corrosion-reistant FRP fan airstream construction from premium quality Vinyl Ester or Polyester resins reinforced with glass fibers; Hastelloy blower wheels and shaft sleeves are available, as well as Teflon, Viton, etc.. shaft seals. Service and Applications: Chemical processing, pharmaceutical industry, food production, petrochemical processes. Wastewater treatment plants, and waste incineration facilities. Design Features: Tubeaxial, Vane Axial, Mix-Flow or In-Line Centrifugal fan design, belt drive or direct drive ventilators. Adjustable pitch axial fan impellers, including controllable in-motion vaneaxial blowers. Available with swing-out, easy-aceess fan construction, roof exhauster arrangements, spark-resistant and explosion proof ventilator construction, as well as high temperature fan arrangements. Service and Applications: High volume lower pressure air moving, industrial and commercial ventilation and air conditioning fans, paint-booth exhaust, air makeup systems and air-handling units. Stainless steel, aluminum, titanium, Ferralium, Inconel, Monel, Fiberglass (FRP), Avesta 2205, Cor-Ten and other high alloys and special coatings are available. High temperature up to 1200 F (2200 C) fan construction. Air-tight & zero-leakage blower construction; special shaft seals: ceramic-felt, viton, teflon, mechanical and ferrofluidic seals, multi-stage lip seals, single and double carbon ring seals. Buffalo Fan © 2009 All rights reserved. - different fan discharge positions are available. - 2-Stage side chanel blowers for higher pressures. - Up to 10 individual blower stages. - HIgh temperature together with high pressure fan applications. - High temperature blower models with heat exchangers between stages. 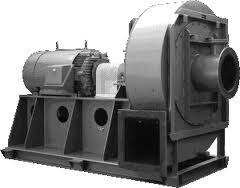 - Material handling fans; combustion pressure blowers . - High temperature and high pressure radial blowers. Commercial and institutional ventilator and fan H.V.A.C. 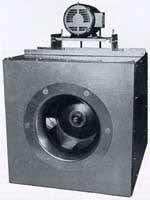 ; gas-fired air fan A.H.U. ; roof and wall power ventilator fans. Propeller and centrifugal up-blast exhaust and filtered roof and wall supply fans; in-line axial blowers and ventilator fans.